I got Raspberry pi B+ and I tried to boot by using NOOBS v1.3.10 and RASPBIAN Debian Wheezy Version:September 2014. Then I got two different problems. 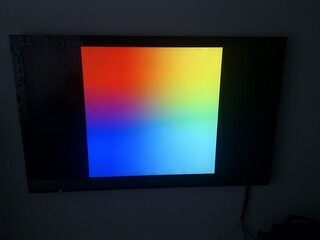 When I boot the Raspberry pi B+ by using NOOBS v1.3.10 I got color screen and it load again and again like below photo. I downloaded NOOBS v1.3.10 and unzip it. After that format the micro SD card by using SDFormatter. ( Run in administrator and using format size adjustment ON ). Then copy files from unzip folder to SD card and boot it up. How to solve this problem ? Can you explain step by step ? When I boot the Raspberry pi B+ by using RASPBIAN Debian Wheezy Version:September 2014 I got color screen after that load some cord and it load again and again like below photo. I downloaded RASPBIAN Debian Wheezy Version:September 2014 and unzip it. After that format the micro SD card by using SDFormatter. ( Run in administrator and using format size adjustment ON ). Then run in administrator the Win32DiskImager and choose the img file from unzip file. Then write to SD card. After that boot it up. Finally I found the problem that is my power supply. It is not 5V output it is around 6.8V that is why color screen after that load some cord and it load again and again. If you find how to check voltage Raspberry pi B+ and B this is the Video I founded. Thank You. You seem to have 2 questions (although I am not sure what the 2nd actually is). Separate these into distinct questions. This suggests various troubleshooting options. I had a similar issue when I first got a Pi which I fixed by adding a file called config.txt containing “hdmi_edid_file=1″ to the SD card before you first boot it (after copy the NOOBS files onto it). Not the answer you're looking for? Browse other questions tagged raspbian boot boot-issues noobs firmware or ask your own question. Why my Raspberry Pi (first version) not boot? Why in Raspberry Pi 3 ACT blink 2 times then stop & PWR always RED?